Samson is my 7 month male chow. Samson has always been distant towards people but he tolerates being around them just fine with a little minimal growling if they come too close. However, if someone (including the vet) tries to touch Samson he goes crazy... we're talking peeing himself, screaming, and snapping at the person. We had to take him to the vet for a hotspot on his head and after I muzzled him the vet tried to examine him and he was so scared that he peed, pooped, screamed, flopped around like a fish out of water, and I am 100% confident he would have bitten her if not muzzled. He has been to the vet 4-5 times prior to this visit. She said his behavior was the behavior of an abused dog and was not normal. Has anyone else had issues with their dog hating being touched by anyone other than mom, dad, & a few select people? Patience. And keep going through these processes. Chow’s take awhile to calm down, usually about 5 yrs old. Our big boy was similar, couldn’t care less anymore at 11 yrs old. Big chane was at 5 yrs, now he even acts like the puppy he never was. Did he have contact with a lot of people as a puppy? Seems like the dogs that don't, usually act that way until they break out of that habit with age. KatlynSamsonsMom wrote: Samson is my 7 month male chow. Samson has always been distant towards people but he tolerates being around them just fine with a little minimal growling if they come too close. However, if someone (including the vet) tries to touch Samson he goes crazy... we're talking peeing himself, screaming, and snapping at the person. We had to take him meilleurs credits en ligne to the vet for a hotspot on his head and after I muzzled him the vet tried to examine him and he was so scared that he peed, pooped, screamed, flopped around like a fish out of water, and I am 100% confident he would have bitten her if not muzzled. He has been to the vet 4-5 times prior to this visit. She said his behavior was the behavior of an abused dog and was not normal. Has anyone else had issues with their dog hating being touched by anyone other than mom, dad, & a few select people? 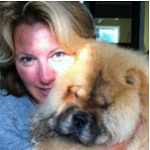 So I have a male chow chow about one year and one month old but Irealy love him!